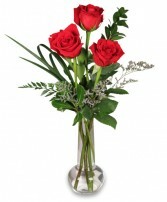 Premium red roses beautifully arranged in a garden vase with deluxe foliage and baby's breath. The finishing touches of an adorable, soft white bear, and an "I Love You" balloon. 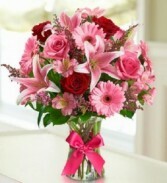 Prices reflect 12, 18, or 24 roses. 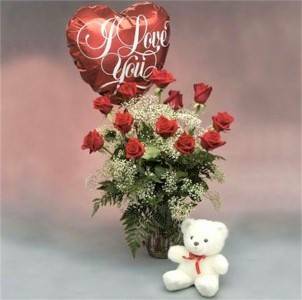 Red Roses, Babys Breath, Mixed Greenery Including Leather Leaf, Tree Fern And Salal, Spring Garden Vase () Or (, ), White Bear, I Love You Balloon. 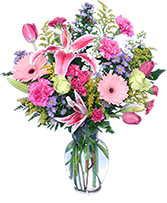 Handarranged, Original Arrangement Of Roses, Lilies, Gerberas, And Alstroemeria, With Support Flowers And Greenery Artistically Designed In A Stylish Clear Glass Gathering Vase Accented With A Satin Ribbon Vase Measures H.
Surprise the one you love with this romantic pink and lavender bouquet from PRANGE'S FLORIST. We use the best available flowers of the day, so varieties may vary. It's a beautiful way to tell her she's still One in a Million! Simple but elegant, three red roses in a clear glass bud vase.